Killing of demon Tataka is a key event in Ramayana. The episode is dealt with in great detail in both Valmiki and Kambar [Dutt, M.N. Bala Kanda: 1897: 69; Kamba Ramayanam: Bala Kandam: No. 7.29 – 7.47]. Being the very first incident that highlights the valor and strength of Rama the warrior, it is portrayed elaborately in many early Chola Ramayana narratives with full emphasis. However, let us first discuss a rare scene from Kumbakonam that captures the personal training provided by Sage Viswamitra to Rama on some advanced archery techniques. 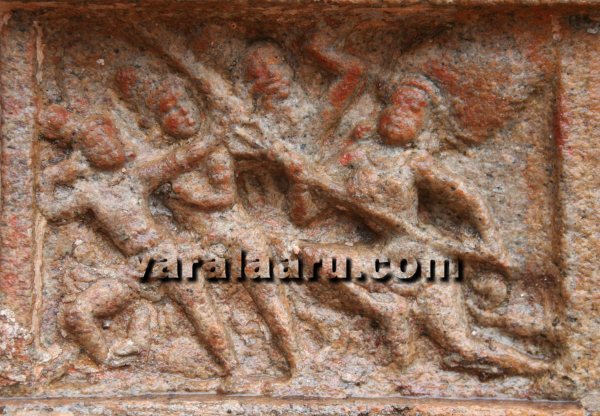 This is a peculiar panel that captures a moment from Ramayana not portrayed in any other Chola temple. It follows Panel No.5 which portrays Viswamitra’s visit to Dasaratha’s court. The panel is divided into two sections. Rama and Viswamitra are portrayed on one half of the panel while Lakshmana and another spectator occupy the second half. Rama is standing in Prathyaleeda posture with a slight bent on his left leg. His right leg is firmly planted on the ground. His left hand is holding a bow; the right hand is stretched in full strength, pulling the cord. He is clad in silk cloth, held tight in his hip with a decorative belt. His headdress is a Jatamakuta and he is wearing Patra Kundalas as ear ornaments. Smiling and face turned towards his guru, Rama is listening to the instructions being imparted with full attention. The Sage is standing in Mandala posture closely behind Rama. His left hand is stretched as if holding a bow, while the right hand is held behind Rama’s. He is in the process of imparting some vital instructions and sacred syllables (Mantras) on archery to Rama. The extreme concern and care of Viswamitra towards Rama is fully visible in his facial expressions and eye to eye contact with the latter. Lakshmana and another spectator are standing in the other side of the panel, witnessing the scene. Lakshmana is holding a bow on his right hand and resting his left hand in his thighs (Katiyavalambitha posture). His head is slightly tilted - suggesting his focus on the conversation happening between the Sage and Rama. The other spectator is not interested in the conversation as such and his head is held straight. The intimate conversation between Rama and Viswamitra is a distinguishing feature of this panel that differentiates its visual treatment from the one at Pullamangai (No.8), discussed earlier. At Pullamangai, Rama has just started his initial lessons on archery. Hence, his emphasis is on copying the body posture of his guru, holding the weapon in right position and stretching the strings. There is no room for conversation here. At Kumbakonam, however, the situation is different. Having mastered the art of archery, Rama is now ready to receive advanced lessons. Hence, the emphasis is on imparting the sacred syllables (Mantras) that need to be uttered while using the weapons with magical powers (Astras). Literatures detail the many Astras bestowed upon Rama by Viswamitra. It is noteworthy that this training panel at Kumbakonam is positioned after the visit of Sage Viswamitra to the court (No.5) whereas the training panel at Pullamangai (No.8) occurs before the visit of the Sage (No.9). This variation in positioning and the conversational feature of Kumbakonam panel help to distinguish the scenes and identify the guru at Pullamangai as Vasishta and the one at Kumbakonam as Viswamitra. The panel is approximately divided into two halves. The portion to the right of the spectator is occupied by a furious Tataka, who is trying to attack Rama in full force. Her round eyes are protruding out of rage. Her headdress is a dreadful Jatamandala, held tight by a thick headband. She is wearing Patra Kundalas in her ears, Sarappali in her neck and is clad in silk dress held by a hip belt. She is holding a long Trisula in her hands. This Trisula finds explicit mention in Kambar’s work as Sulappadai [Kamba Ramayanam: Bala Kandam: No. 7.45] but Valmiki does not mention the weapon or its usage. It is noteworthy that all early Chola Ramayana panels portray Tataka with a Trishula without exception. Even though she is sculpted at ground level, her bent legs suggest that she is actually flying high in the sky. This is confirmed by the position of Rama’s arrow which is pointing upwards. Rama, his brother Lakshmana and the Sage are seen on the other half of the panel. Standing in Aleeda, Rama is bending his bow in full measure and is shooting arrows up in the sky. His attire is similar to the one seen in an earlier panel (No.6). Lakshmana is standing very close to him and is almost imitating Rama’s posture. However he is not holding a bow. Sage Viswamitra is standing next to them and is hailing the heroic deed of Rama by showing Vismaya Mudra in his left hand. There are four characters in this panel. Three of them (Rama and company) are sculpted on one half and Tataka occupies the other half. By dedicating almost half the panel space, the sculptors have attempted to project Tataka with equal importance as that of Rama. Such a treatment is not seen at Pullamangai. Rama the archer is the focal point of this panel. Standing in Aleeda, he is twisting his body almost 180 degrees and is shooting arrows at Tataka – who is attacking him from the sky. By portraying the rear view of Rama instead of the front view, the sculptors deftly capture the full turn of Rama’s body – suggesting that Tataka is flying in all directions in the sky. Such rear view and side view portrayals are peculiar to Pullamangai not seen at Kumbakonam. 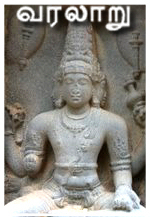 Lakshmana is standing next to him. The Mudra he is showing on his left hand is unclear. Viswamitra is standing on the extreme left of the panel, showing Darjani Mudra on his right hand – suggesting warning; his left hand is held in his thighs in Katiyavalambita posture. On the bottom right corner, we see Tataka being disturbed from her peaceful slumber and waking up to the valiant sound made by Rama’s bow string. Her posture is very natural. 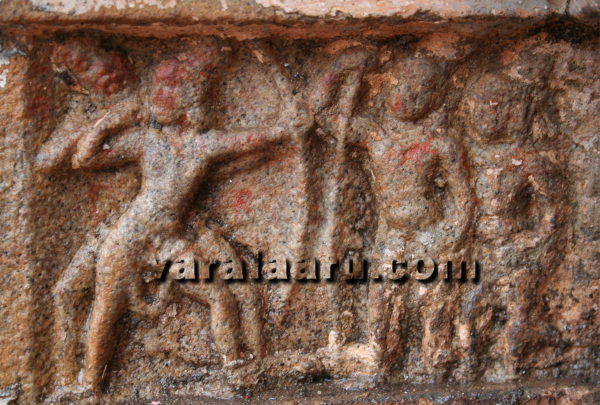 On the top right corner, she has climbed up the sky (as suggested by the leg posture and flight of hair in Jatamandala) and started attacking Rama with her trident (Trisula) in full force. Her protruding eyes are full of rage. The fall and death of Tataka, which is the theme of panel no.8 at Kumbakonam is not portrayed at Pullamangai. In both temples, the total number of characters portrayed is four. However, in terms of composition and space allocation to characters, significant difference is observed between the two. Kumbakonam divides the panel into two halves and provides equal importance to Rama and Tataka. However, Pullamangai shifts its full focus on Rama and provides relatively lesser space and importance to Tataka. The slumber of Tataka and she wakes up to the sound of Rama’s bowstring is captured elegantly in Pullamangai. This is totally missing from Kumbakonam. The attack of Tataka is captured to its full potential at Kumbakonam. The full force of her body is clearly suggested by her body posture and flight of hair. The rage in her eyes is full. Such details are missing in Pullamangai. However, Pullamangai takes a lead in portraying her in the sky – from where she is really fighting. Due to its compositional feature, Kumbakonam misses this detail. 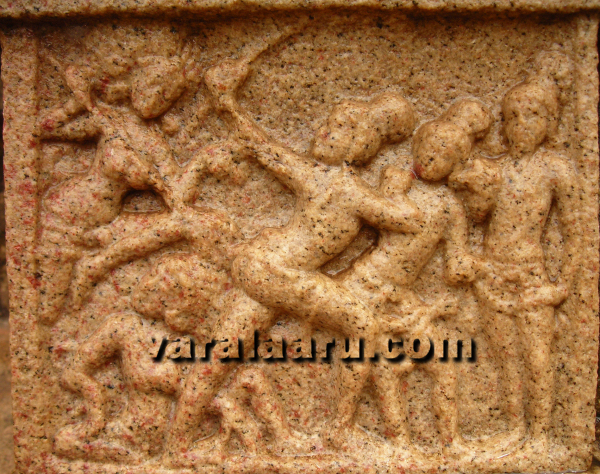 The posture of attacking Rama is best available at Pullamangai. The extreme twist in his body and the rear view portrayals elevate this panel to subtle levels.